It was a strange season for Purdue in 2002 -- on paper (statistically) the Boilers looked like they had a great year. But only three straight wins at the end of the season, including a Sun Bowl victory over Washington, got their final record over .500 at 7-6. The difference in close losses to Notre Dame, Iowa, and Ohio State totaled 14 points- three teams which spent most of the season in the Top Ten. Purdue starts 2003 with five of its first six games at home, including the annual shootout with Notre Dame, and match-ups with Big Ten rivals Michigan, Wisconsin, Illinois and Penn State - games which will decide whether the Boilermakers can push for a New Year's Day bowl. In addition, Purdue's only non-conference road game is at up-and-coming Wake Forest - definitely winnable if the Boilers have their game in gear. The defense is poised to carry the team, just how far will be up to the competence of the offense. Enough firepower is back for Purdue that the situation is theirs to make, or break. Young student athletes can make situations like this special or disappointing. Our guess: They'll be more successful than not, and while perhaps not headed for Pasadena, Purdue fans can likely pencil in a little bowl-game sunshine come next holiday season. Scoring: Berin Lacevic, 10-19 FG, 48-49 PAT, 78 pts. ; John Standeford, 13 TD's, 78 pts. Punting: Brent Slaton, 63 punts, 39.4 avg. Kicking: Berin Lacevic, 10-19 FG, 48-49 PAT, 78 pts. Interceptions: Niko Koutouvides, 3 for 21 yds. Kickoff returns: Anthony Chambers, 10 ret., 23.0 avg. Punt returns: Anthony Chambers, 28 ret., 10.0 avg. 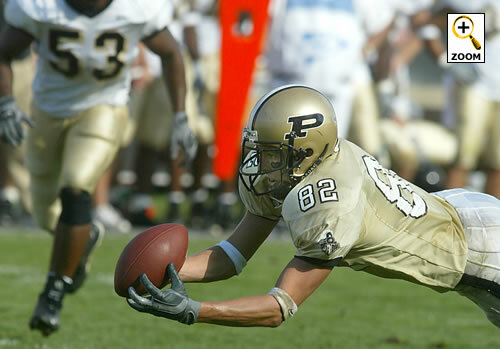 The Boilermakers return virtually all of their skill-position starters in 2003, signaling good things ahead for coach Joe Tiller's high-voltage offense. Purdue rang up 29.7 points per game in 2002, third in the conference, and with most of that talent back with another year of experience, Tiller should have another potent offensive team. Rangy junior Kyle Orton (6-4, 215) is at the controls after a decent 2002. He'll be backed up by sophomore Brandon Kirsch., who threw for 1,067 yards and eight scores in part-time duty, replacing Orton in the starting lineup for four games during a mid-season slump. Kirsch also rushed for 468 yards, presenting defenses with a whole different nightmare to contend with compared with the more traditional passer Orton. Accordingly, a rotation could be to their advantage. Whether the starter is Orton or Kirsch, either will be throwing to senior John Standeford, a Bilitnekoff Award finalist in 2002 and the top returning Big Ten receiver. After grabbing 75 passes for 1,307 yards and 13 TDs, not much else needs to be said. Opposite Standeford, junior Taylor Stubblefield actually led the conference in total catches with 77, but didn't present the long ball threat of Standeford. This complimenting pair also offer differing talents that opposing coaches cannot fully stop. The Boilers use a three-wideout set. Sophomore Ray Williams finished the season as that third starter. He caught only eight passes in 2002, but one was a 58-yard score, and he will provide another deep threat that then frees Standeford. Senior Anthony Chambers was third on the team in catches, and is likely to push hard to get back into the starting lineup. Competition bodes well for this position. With Standeford and Stubblefield back in the fold, the Purdue receiving corps looks like one of the best in the country. Running back is another solid talent position for Purdue. Back for his senior year is Joey Harris, a compact 5-11, 215-pounder who can handle a heavy load. Backup Brandon Jones, now a sophomore, added 683 yards on 127 carries, and actually had a superior yards-per-carry mark than Harris (5.3 to 4.8). With the wide receiving corps keeping the defenses spread and distracted, Purdue should again be able to run effectively. They were fourth in the Big Ten in rushing offense - just ahead of national champion Ohio State. Charles Davis took over the starting tight end spot as a redshirt freshman in 2002 and responded well. TE blocking will be important early as this line gets acquainted with each other and the system, both individually and as a unit. Starter Mike Rhinehart has been released from scholarship for health reasons. The offensive line doesn't exactly look like a disaster area for Tiller, but it will require some retooling. Two fifth-year senior starters graduated, along with a couple key reserves, so the younger Boilermaker linemen will have to keep helmets on defenders so as to allow the skill-position players success. Junior tackle David Owen and senior center Nick Pilipauskis are the only experienced backups returning - meaning several redshirt freshmen and possibly incoming recruits are going to have to contribute for the Boilers. In addition to being thin in numbers, Purdue is thin on the OL in a more literal sense. Amazingly, in the age of monstrous musclemen on the front lines across college football, not a single Boilermaker starting OL is listed at over 300 pounds. Even allowing for a little bit of a fudge factor in those listings, that's still a remarkably lean front line by top-level Division I standards. Purdue's impressive rushing totals, combined with only middle-range numbers in sacks allowed, indicate that regardless of size, the Boilermaker front-liners have definitely been doing things right. Tiller's version of the spread places more emphasis on speed than bulk. But despite leading the conference in total yardage, Purdue was ninth in red-zone efficiency, converting only 75.5 percent of the time inside the 20 - exposing a definite weakness in the Boilers' attack. Another problem for the Boilers was turnover margin. Purdue ranked next-to-last in the conference in turnover margin. Needless to say, improvement in that area is crucial. Senior linebackers Niko Koutouvides and Landon Johnson are back after ranking 1-2 on the Purdue tackle list last season. Koutouvides mans the middle while Johnson plays the weakside. On the strongside, senior Gilbert Gardner will have first shot to step into a starting role. Up front, the Boilers return all four starters. That says much - the core of the nation's 23rd ranked run-defense will be measurably better, both individually and as a unit. The Boilermakers had excellent defensive balance in 2002, ranking fourth in rushing defense and fifth in passing defense in the Big Ten, which added up to the best overall yards-per-game defensive average in the conference, and 20th nationally. As the football savvy know, it all starts up front. Really, it's hard to pick out a glaring weakness for the Purdue defense - just a few areas where they could be better. Just as the Boiler offense piled up some gaudy stats yet misfired in the red-zone area, the Purdue defense had excellent overall numbers yet allowed the fourth-worst red-zone scoring average in the conference. The Boilers allowed 10 scoring passes from the red zone area in 2002, definitely an area where improvement could make a huge difference in the W-L record. The talent is there. Senior FS Stuart Schweigert returns after a somewhat disappointing 2002 season. The 6-3, 215-pounder was tabbed as a top pre-season contender for all-conference honors, but ended up with only two interceptions. Of course, that was due in part to the reluctance of opponents to throw into his coverage areas, but a big rebound by the experienced Schweigert in 2003 will provide a huge spark for the defense. The other secondary members all re-form as one to make up the same basic unit that was ranked 23rd in all I-A for pass efficiency defense. 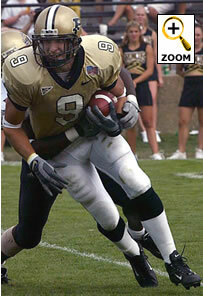 Senior punter Brent Slaton was consistent, if unspectacular, for Purdue in 2002. He averaged 37.7 yards per boot, and the Boilermaker coverage unit allowed only 3.6 yards per return - third best in the conference - for a decent net of 34.1, fourth in the league. The rest of the Boilermaker special teams ranged from passable to pathetic. Placekicker Berin Lacevic was decent on PATs but erratic on field goals, converting only 10 of 19 attempts. He should be pushed by junior Aaron Levin. The Purdue kickoff coverage team ranked right in the middle of the conference standings, allowing 20.2 yards per runback, but both the Boilermaker return units - kick returns and punt returns - ranked dead last in the conference. Backup WR Chambers handled both those duties in 2002, but it's wide-open competition for both positions in spring and summer drills. We will get back to you on this one. Some freshmen who should see time this year are DE Ray Edwards and SS Bernard Pollard, as well as FS Rafael Price. Look for Purdue to block a few kicks this season, as they have made a concentrated (and successful) effort this spring to shore that area of the special teams.